June 21, 2016 – This month, NASA took a major step toward creating a Solar System Internet by establishing operational Delay/Disruption Tolerant Networking (DTN) service on the International Space Station. The DTN service will help automate and improve data availability for space station experimenters and will result in more efficient bandwidth utilization and more data return. 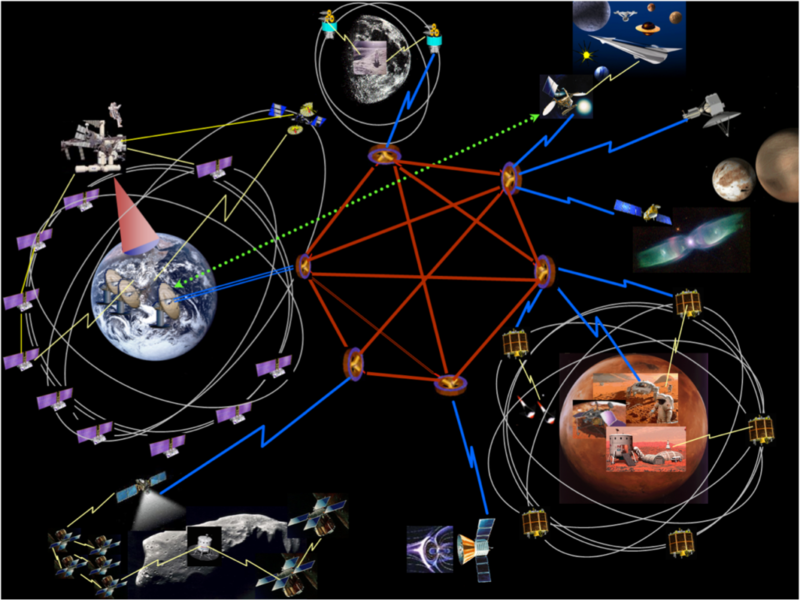 DTN works by providing a reliable and automatic “store and forward” data network that stores partial bundles of data in nodes along a communication path until the parts can be forwarded or retransmitted, then re-bundled at the final destination – either to ground stations on Earth, robotic spacecraft in deep space, or, one day, humans living on other planets. This differs from traditional Internet Protocols that require all nodes in the transmission path to be available during the same time frame for successful data transmission. Aboard the space station, DTN was added to the Telescience Resource Kit (TReK), a software suite for researchers to transmit and receive data between operations centers and their payloads aboard station. This service on the station will also enhance mission support applications, including operational file transfers. This first use of the service as an operational capability on a space mission marks the beginning of the space station as a node in the evolving Solar System Internet. In addition to use in space, DTN can benefit environments where communications are unreliable, such as disaster response areas. NASA worked closely with one of the “fathers of the internet,” Dr. Vinton G. Cerf, vice president and chief internet evangelist for Google and a distinguished visiting scientist at NASA’s Jet Propulsion Laboratory in Pasadena, California, to develop DTN. Dr. Cerf sees extended benefits of this networking service that can be used here on Earth. To ensure wide adoption of DTN, NASA has worked with the Internet Research Task Force (IRTF), the Consultative Committee for Space Data Systems(CCSDS), and the Internet Engineering Task Force (IETF) for international standardization. In addition, many DTN implementations are publicly available as open-source code, making them available to the growing number of collaborators in space, including university researchers, commercial networking developers, CubeSat developers, and space station payload developers. The space station will initially use two of them, NASA’s Interplanetary Overlay Network (ION) implementation and the IRTF’s DTN2 implementation. This networking service represents more than a decade of work led by NASA’s Advanced Exploration Systems, which pioneers new approaches for rapidly developing prototype systems, demonstrating key capabilities, and validating operational concepts for future human missions beyond Earth orbit. AES activities are uniquely related to crew safety and mission operations in deep space, and are strongly coupled to future vehicle development.